The consortium will ensure that it meets its obligations regarding the management of ‘foreground’: protect it, use it and disseminate it. In addition to the PALE-Blu projects list of peer reviewed publications. The list of workshops, seminars and presentations below demonstrates how PALE-Blu partners are disseminating and sharing knowledge in practice. You will find a list of PALE-Blu publications linked below. 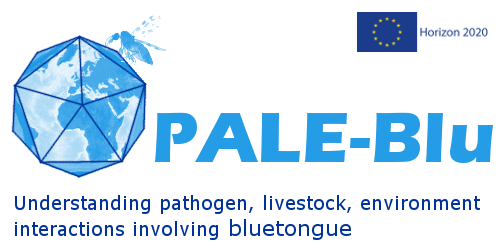 Sailleau C, Breard E, Viarouge C, Gorlier A, Leroux A, Hirchaud E, Lucas P, Blanchard Y, Vitour D, Grandcollot-Chabot M, Zientara S. Emergence of bluetongue virus serotype 4 in mainland France in November 2017. Transbound Emerg Dis. 2018 Jul 2. doi: 10.1111/tbed.12919. PMID: 29885075.